The owners of Pine Box Rock Shop—that’s Jeff and Heather Rush and Colin Peer—have a thing for weird spaces. 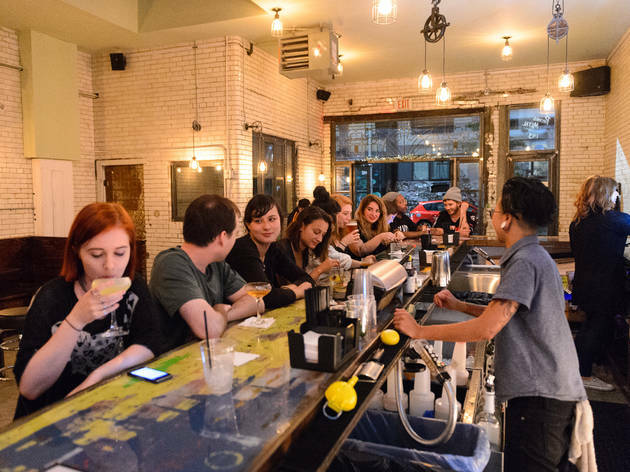 That Bushwick bar, if you couldn’t tell by its name, is housed in a former casket factory. 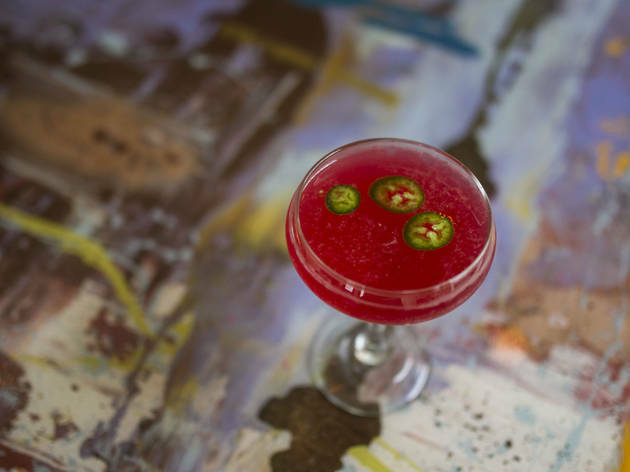 Their new cocktail bar’s previous life gets a nod in its title too: It was once a metalworking shop and, more recently, a DIY event space known for hosting cosmic yoga classes, raves and body-healing workshops. Its current use speaks to the neighborhood’s shifting demographics and tastes—New Age music has been replaced by scruffy indie rock, disco lasers by Edison bulbs, sometimes-naked shamanic rituals by Tinder dates, hushed conversations and two TVs airing ESPN highlights. Precious Metal’s mission is less esoteric than the previous tenant’s, sure, but as a neighborhood bar, it does a good job of avoiding many of the pitfalls that come with gentrification: The decor is unpretentious, the beers and cocktails are reasonably priced ($7 and $12, respectively), and the selection is thoughtfully chosen enough to warrant a trip even if you didn’t just move into those CastleBraid luxury apartments across the street. ORDER THIS: Cocktails ($12) are the move here. 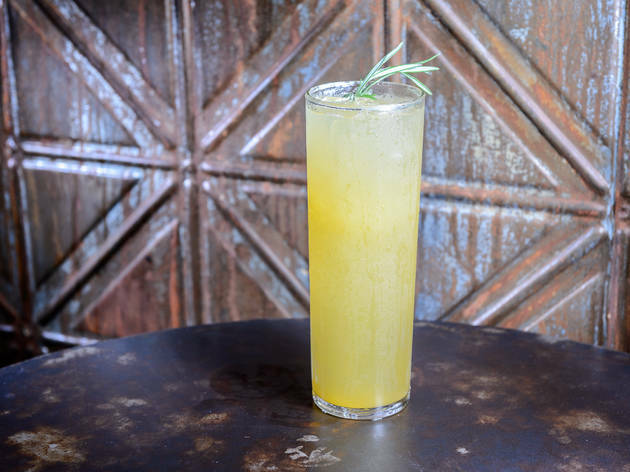 A Tin Roof layers whiskey, simple syrup and lemon with a cabernet floater—the dryness of the wine dominates, with syrupy sweetness underneath and aromatic notes provided by a dusting of lemon zest and nutmeg. The gin-based Bunny Hop echoes the honey and lemon of a Bee’s Knees, substituting lime and grapefruit with an extra lupulin kick of amarillo hops. Another sour-sweet winner is the vodka-and-ginger-beer Copper Mule, laced with subtle hints of warm-weather, rosemary-infused peach nectar. GOOD FOR: A lo-fi first date—or any occasion that’s cause for stepping up your Brooklyn drinks game from a standard beer and shot. Interiors are dimly lit, with sparsely adorned white-glazed brick walls, tables made from repurposed oil drums and rough-hewn wooden benches. 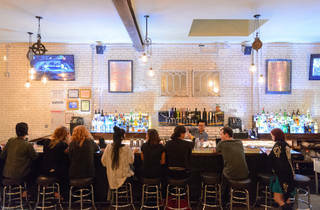 Grab booze-soaking carbs beforehand at pizza spot Archie’s Bar & Pizza around the corner, then slip into one of the bar’s quiet corners, with minimal competition from the fuzzy rock on the stereo. 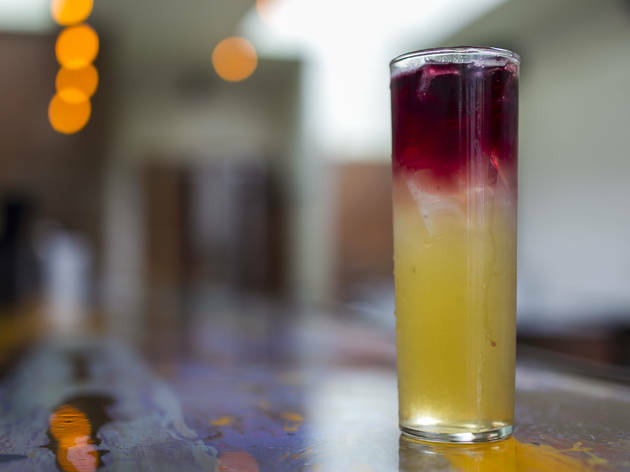 THE CLINCHER: Its signature cocktails are varied enough to suit most tastes and pack plenty of punch, but the well-curated beer list seals the deal. 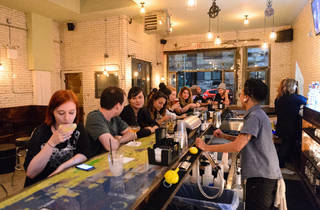 Eighteen rotating taps focus on seasonal offerings from local brewers like Ommegang, Other Half and Threes, with recent selections like a Cuzett Grisette ($6), a light, tart Brooklyn farmhouse ale. Regardless of whatever happens in the rest of the ’hood, this spot’s a gem. My favorite bar. Alissa and Julie are the best, hands down. Very pleasant, and welcoming. They are everything you want in a local bar: a great beer menu, great atmosphere, great service, and they know our names! ❤️ We always stop here to end the night before going home. Great micro-brewery beer choices in a bar that used to be a slaughter house. Nicely priced, comfy ambiance, top-notch bartenders, friendly patrons. The end. Inventive cocktail list paired with an inviting space. Really love this hip bar in Bushwick. It's a bit of a trek if you're coming in from Manhattan and it's about a 10 minute walk from the L train. The bar is super spacious and they have great happy hour specials with $4 well drinks. This place opened just a five minute walk from my apartment, and I could not be more pleased. It's become my new go-to when I want a good drink but don't want to go far. 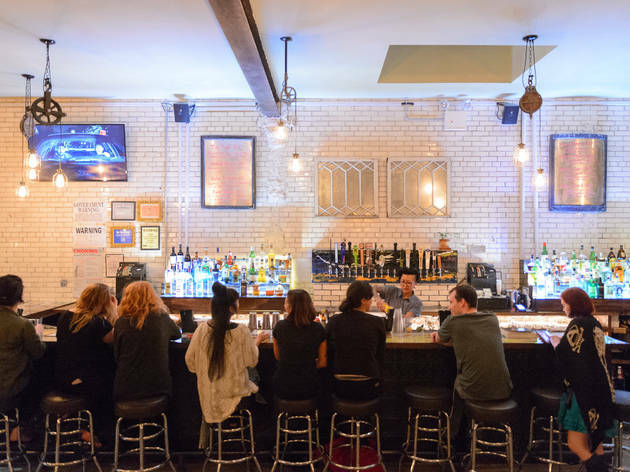 This bar is in a good-sized space on Troutman Street. There's lots of room and the idea is simple: good drinks, great bartenders, good place to sit and chill. Last time I was in they had Allagash Curieux on tap, which I've never seen before, and Curieux is an EXCELLENT beer. I also had a gin cocktail that I can't remember the name of, but it was super refreshing and like dirnking gin elixir. 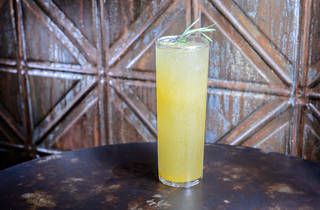 I'm usually more of a mescal cocktail person, but I would go back for that gin cocktail over and over.